Over the last seventy years of innovation management theory, the challenge “to innovate” is at last giving way to a practical understanding of innovation as a legitimate tool for facilitating continuous business change and for progressing competitive advantage. The crucial differentiator in distinguishing a business’s success lies in its ability to sense and adapt to the ever-changing market environment. In today’s business terrain, adaptive organizations that can recognize and rapidly leverage industry changes will grow, while efficiency-oriented organizations, regardless of size, history, or plans, will decline. Technological innovation is increasingly understood as a major contributor in preserving an organization’s continuous momentum within a variable environment. The business community now recognizes the imperative to better align innovation with business strategies. Nevertheless, innovative-technology implementation projects of are not always successful, particularly for complex system re-designs. The reasons for these failures are notoriously complex. First, the interactions between an organization and novel technologies are necessarily disruptive. Further, each organization is unique – an implementation of a particular technology may work for one organization, yet fail for a seemingly similar organization. Finally, the implementation of technologies presents a learning challenge to the organization, which necessitates interpersonal coaching as well as technical-skills training. The challenge for an organization, then, is not only to keep pace with the technological innovation through planned implementations, but also to accommodate the disruptions of technological change through continuous organizational learning. Traditional approaches to technological implementation attempt to organize and control the process of change via formal project planning approaches. Focusing on change as a rational, positivist component of organizational management, planned-based change approaches focus on deliverables, formal roles, stage gates and oversight review bodies . In approaching change thus, however, project planning generally neglects the integration of modern organizational change-management wisdom, and instead masks highly subjective approaches behind a veneer of objectivity. Despite the growing understanding that effective change management and leadership significantly influence the success of an organization’s implementations, industry-standardized approaches to project management consistently fail to consider social/psychological issues impacting change . As evidenced by the widely acknowledged implementation-failure rates at or above 50%, organizations can no longer afford this isolationist approach to technological implementation – the integration of project management and organizational management is a necessity. Because technological adoption initiates intra-organizational change, technological implementation may be approached, therefore, as an organizational learning challenge. Whereas most technological implementation approaches plan projects from a technology-centric focus, a learning approach demands a holistic planning perspective that considers technologies, users, and business processes as integrated partners enabling the system’s performance. From this integrated people-process-technology perspective, project planning necessarily becomes a much smaller component of an organization’s modernization strategy. Instead, the necessity for an organization to define, map and comprehend its essential business processes emerges as a non-negotiable prerequisite to all implementation initiatives. In understanding each technology as an enabler and partner within a system rather than as the end-all objective, project planning of technological injections orients both the user and the technology to strategic-level improvements. A requisite for implementation success, change must be accepted and managed throughout the organization. Shifting perspectives, the management of change is the management of resistance. Change suggests resistance, and resistance implies change . A behavioral expression of user opposition to a system or technology implementation, resistance may work either to benefit or to sabotage a project, depending on how it is managed. As Markus stated in “Power, Politics and MIS Implementation”, resistance is not a problem to be solved so much as it is a useful clue as to what went wrong. He proposed three theories for explaining why resistance may occur: (1) internal factors; (2) external factors; (3) the interaction of internal and external factors . Internal factors, which arise from individual and/or the group of end-users, may be mitigated through efforts targeting those end-users. For instance, resistant parties may be removed, educated, persuaded, and/or increasingly involved as participants. Resistance as a response to external factors offer important clues as to the adequacy and/or usability of the system or technology being implemented. This systems-based resistance may be addressed through attention to ergonomic features and other modifications, and through increased user-involvement during the design phase of the implementation project. Each of these first theories may be addressed throughout the process of change implementation, although success of the effort depends upon proactive response. Resistance falling within the realm of the third theory, however, presents a unique, political challenge to the organization, which must be considered prior to the introduction of technological change. Direct changes to modify internal and/or external factors through education, increased participation, modification, etc. will insufficiently address resistance resulting from the interaction of the technological system with the power dynamics of the organization. The greater the impact of the technological design on existing power structures, the greater the resistance from those who perceive they have lost power. To anticipate interaction resistance, leadership must identify, understand and re-engineer potential and existing organizational barriers to change before implementing a new technology. To counteract both internal and external factors contributing to resistance, increased end-user involvement not only transforms user skepticism and technological usability, it also better enables implementation success by fostering an enterprise-wide sense of ownership of the initiative. End-to-end user participation and integration help to mitigate both the threat of change and the threat of reduced control. Particularly for highly complex initiatives, technological change may radically disrupt an employee’s perception of their role, their tasks, and their value. The planning of end-user involvement in addition to that of management throughout implementation thus empowers down-stream works to maintain a view of their role within the organization, and a sense of their control over change. Additionally, a high level of participant diversity brings critical insights and knowledge, helping to ensure the alignment of external factors with internal needs. Users’ involvement in understanding how the new system will impact their daily functions and tasks is critical in a variable business environment. Additionally, the involvement of executive leadership helps to ensure the endurance of an organization’s commitment to the successful adoption of technically-enabled change. Whereas resistance may be understood as a behavioral effect, commitment is a state of mind that reinforces a line of behavior. Executive-level commitment is one of the most important factors in the success of technological implementation. However, for the implementation to succeed, commitment must extend throughout the entire organization, and must persist throughout the project’s life-cycle. Thus, the role of leadership in managing technological implementation is necessarily one of top-down championing of essential change. The project champion is the front-runner and promoter for the project throughout the organization. This champion acts as an advocate for the system, who is unswerving in promoting the benefits of the new system, and who has the power to set goals and legitimize change . The project champion boosts the morale of the project among its team members and ensures the commitment of all members. Moreover, the project champion plays a powerful role in neutralizing skeptics by converting them into additional project champions, thus facilitating enterprise-wide support. Departing from the traditional technology-centric bias of project management, the planning of end-user engagement from the beginning of the implementation effort helps both to mitigate the internal factors contributing to resistance and to champion enduring commitment throughout the project’s life-cycle. The growing perception of IT as contributing to strategic advantage in business competition make technologies a prime candidate for misapplication. In seeking to increase market relevance, corporate decisions about the adoption of innovative technologies are made without careful and detailed analysis. Because the industry-dominant matrix structure of organizations functionally segments information into silos, the isolation of process-centric implementation initiatives functionally strengthen communication barriers within an organization. Further, susceptibility to bandwagon pressures to adopt new technologies result in major IT project, which are poorly managed. Targets for the applications of technologies are not developed; configuration management is not controlled, and the posture of the application within the organization is not a smooth link or adjustment, and further improvement is being discussed before the originally implementation is complete . In Strategic Planning for Information Systems (2013), Ward & Peppard describe the activities that an organization must perform to ensure that its information technologies contribute directly to achievement of the business objectives . First, an organization’s performance objectives and their supporting information needs must be identified. According to Ward and Peppard, the best context for IT/IS strategy development and implementation is deriving the IT/IS strategy alongside all other organizational component strategies, rather than independently. Next, leadership must implement a program of initiatives to deliver the business strategy, which includes the critical IS/IT development as an integrated component within other business initiatives (2013). A thorough understanding of the business strategy is essential – most re-engineering initiatives will spring from, and be part of, an enterprise-level strategy. At a variously-estimated failure rate at between 40-70%, the tremendous cost and incurred waste of technological implementation initiatives that either fail or supersede their scopes demand radical re-orientation from a strategic-level paradigm. Choosing the right strategy and the right approach to technological implementation is crucial; innovating organizations must rethink their initial efforts, their processes, and even their data. No longer can technologists advocate for innovative technologies as the end to undefined problems. Instead, the needs of the system as its own entity must be understood, and thereafter technology introduced as a component of the solution. For the competitive organization, this re-orientation from business functional-area to enterprise-level performance is not only necessary, it is non-negotiable. The pro-technological bias inherent in approaches both to business-process management and to project management develop initiatives from the perspective of the CIO, and inject technologies as solutions to business-level performance. Likewise, determinations of project “success” reflect a primarily middle-management perspective, and consider project risk via metrics of timeliness and cost. Many organizations fail to adequately or systematically address the question of how business processes may themselves be transformed by IT. What more, they fail to align technological implementation at the process-level with strategic performance at the systems level. A system’s approach to technological implementation re-focuses the prevalent, project-centric and functional-area orientation of workflows, roles, and decision points to the interdependence between people, processes and technologies, which together support the performance output of the entire organization. A common theme throughout emerging research on technological implementation is the need for strategic alignment of people, processes, and information. 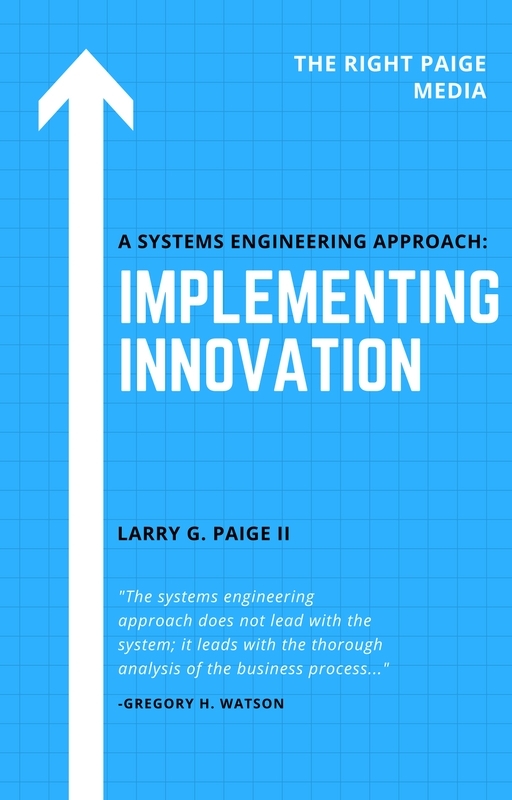 To this end, a systems engineering approach to technological implementation does not lead with the technological system – it leads with a thorough analysis of the business process . Thus, in planning for innovation, leaders must consider the business as a holistic system, and approach technological implementation from both change management and project management frameworks. They must consider and integrate the experiential contexts of previous implementation efforts into a learning-centric methodology for approaching and managing continuous systems change. Technology, even innovative technology, is an enabler of system performance, when appropriate. Ahituv, Niv & Zviran, Moshe & Glezer, Chanan. (1999). Top Management Toolbox for Managing Corporate IT. Communications of the ACM. 42. 93-99. 10.1145/299157.299177. Ward, J., & Peppard, J. (2013). Strategic planning for information systems. Chichester: Wiley. Watson, G. H. (1994). Business systems engineering: Managing breakthrough changes for productivity and profit. New York: Wiley.